Navigation or menu is an important part of the website design. It helps in creating a user-friendly website and allows users to access the content of your website in an easy way. Navigation must be simple, neat, easy to use and creative. So having a nice navigation is better for your website. Try these jQuery Navigation Plugins. In this tutorial, I am posting few popular jQuery plugins which help developers in making beautiful navigation on the website. You can also create your own navigation system with jQuery and CSS. And you can customize all these plugins if you have some knowledge of CSS, HTML, and jQuery. All these given plugins are cross-browser compliant and easy to use. cbFlyout is a nice jQuery plugin to create responsive off-screen navigation on your website. It is available for free to use. PgwMenu is another SEO compliant fully customizable menu plugin. It is very small and comes in the size of 2.5 kb of files. Fixed Nav is a responsive and touch friendly one-page navigation plugin. It also shows the animation while scrolling and will be fixed on the top. FerroMenu is another nice free jQuery plugin to add animated responsive user-friendly navigation on your website. It shows bubble menus that can be dragged around the screen. SlickNav is a multi-level, flexible, cross-browser compatible and responsive jQuery menu plugin. SmartMenus is also a good jQuery menu plugin to add responsive and list based website menu that works on all devices. 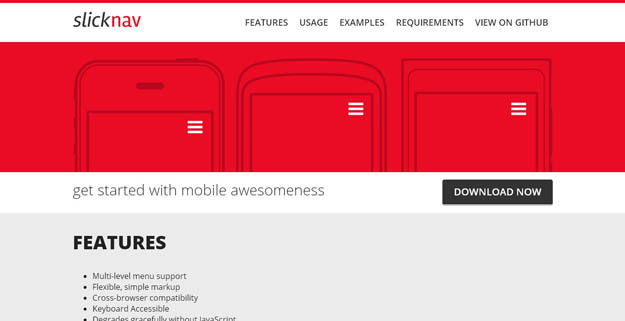 Drop Down Navigation is a responsive touch friendly dropdown. MenuItems is a dynamic jQuery menu plugin to add a beautiful and responsive navigation widgets. Material Menu is a good quality responsive menu jQuery plugin.